So how do you review a movie like this? Like the summer blockbuster the fairy's devoted fans, who have lifted Tink and co. from what should have been a straight-to-DVD franchise to a bona fide 3D cinema outing, will not pay heed to any negative words a critic might offer up. 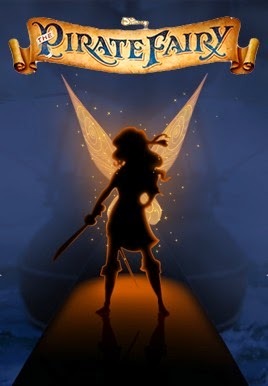 And the truth is that while The Pirate Fairy might be as simple a story as can be it will prove an entertaining (and thankfully slim) seventy-eight minutes for the kids. Oh, and the singing is kept to a minimum. Always a bonus that. So what is there to critique? Underneath the beautiful colours and the pretty fairies who flit around wondrous scenery, The Pirate Fairy has a few things to say. 'Tamper ye with science and mischief will reign,' is the one that sticks out. Zarina’s insistence to push science (the fairy dust) is punished first by the ecological disaster she causes to Pixie Hollow, then by her banishment, and further by alliance with the treacherous pirates. Best leave things untouched, Pirate Fairy seems to say. And it says more. With each fairy given a particular skill - whether it be control over light or water - confusion and chaos takes hold when the skills are unceremoniously swapped around the unsuspecting fairies: 'Rejoice in your pre ordained roles' is a rather unambitious message for a child, don't you think? It's quite possible, however, that I am reading too much into it. But there is little for an adult to do here.